Aside from giving you a strong appearance, training your chest muscles (pectoralis) allows for better movement of your shoulder joints, which in turn, improves movement of your arms for actions such as punching, throwing and lifting. If you don’t already have a set of resistance bands, I would highly recommend that you check out Bodylastics Resistance Bands as their equipment is of high quality build and made to last. Here are five of the best resistance band chest exercises. Mount your resistance band using the door anchor at the middle of the door frame, just under chest height. Attach both ends of the resistance band onto one handle. Standing with your side to the door, grab the handle with the hand closest to the door. Bring your arm forward and around in an arc, so that it’s at the center of your chest (keep your elbow slightly bent). Bring back it back to its original position and repeat, then switch sides. 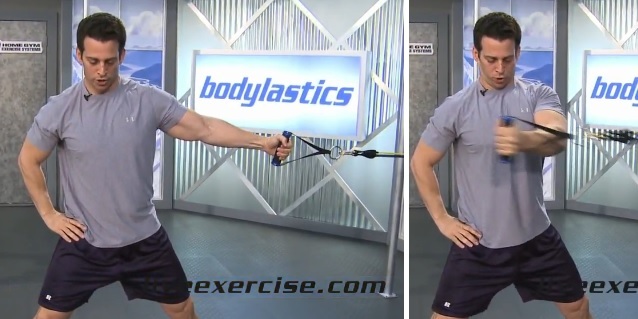 Wrap the resistance band around your back and keep it under your armpits (you do not need the handles attached). Get into the push up position and make sure that your hands are pressed down firmly at the ends of the resistance band. Slowly perform the press ups and you’ll feel added resistance on your arms. This exercise is similar to a bunch press motion. Mount your resistance band using the door anchor at the top of the door frame. Attach each end of the resistance band onto a handle. Grab both handles loosely, so that you taking your bicep muscles out the equation. Get on one knee with one leg bent forward. Keeping your palms facing up, pull down on the handles while keeping your chest up. Mount your resistance band using the door anchor at the middle of the door frame, stomach height. Attach each end of the resistance band onto an ankle/wrist strap. 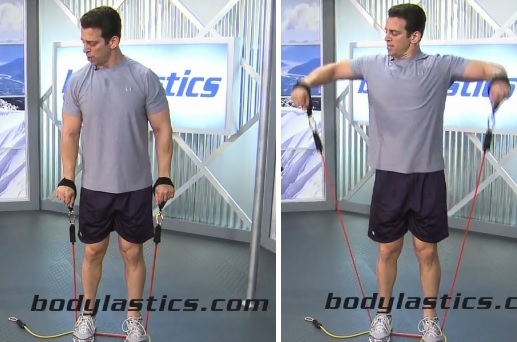 Put your hands through the straps and grab onto the end of the resistance band loosely. Get on one knee with one leg bent forward, keep your back straight, head and chest up. Pull backwards while keeping your elbows bent and tucked in. Stand on the center of the resistance band. Keep your arms internally rotated so your palm is facing downwards. Pull upwards while keep your elbows bent at around 45 degrees. Do you want a full body workout device that will increase your strength & speed while minimizing injuries? If the answer’s yes, then I highly recommend Bodylastics Resistance Bands. This portable and high quality but affordable exercise system allows you to work on specific muscle groups, lose weight through simple cardio workouts and emulate gym machines & sporting movements. Click here to check it out now! Bodylastics Review – The Best Resistance Bands Around?